ServNet auction owners and members of its executive team met for the group's semi-annual business meeting and a visit with national remarketers at a Meet the Owners event last month. At the Owners' Meeting, members discussed the group's Leadership Succession, which will occur this fall. Carolina Auto Auction’s Eric Autenrieth will assume duties as ServNet's president, and current president, Kevin Brown of Missouri Auto Auction, will be succeeded by Patty Stanley of Carolina/Indiana Auto Auction as chairman of the board. "The dominant competitive advantage of ServNet Auctions is its dynamic Owners Group, many of whom are second- and third-generation auto auction operators. ServNet's semi-annual Owners' Business Meetings are prime opportunities for the auctions' owners, who have decades of experience and a personal investment in the industry, to discuss the challenges of the market, as well as to identify opportunities for growth and explore new methods," said ServNet chief executive officer Pierre Pons. The group also discussed the role ServNet next generation auction owners will play in building and strengthening the independent auction group. "While the board as it currently stands is led by first-generation owners Kevin Brown and Patty Stanley, the remaining five seats are filled by next generation owners Eric Autenrieth, Beth Barber (State Line Auto Auction), Steve DeLuca (Auto Auction of New England), Ashley Dietze (San Antonio Auto Auction) and Rob Thompson (Mid-State Auto Auction). These owners have all developed into strong, capable, visionary leaders in their own right, as they continue the pattern set by their parents in building the family businesses," said Pons. "Their participation helps ensure the vitality, longevity and strength of our organization." Additionally, the group reviewed the impact their moves to smaller, mobile auction operations in secondary markets, as well as the impact of incentives or rebates to high volume customers on both the dealer and commercial sides of the auction business, according to ServNet. Following the business meeting, ServNet's owners and executive staff met with Dallas-area based commercial accounts and industry partners at a Meet the Owners Luncheon. During the luncheon, the group announced the seven winners of this year's ServNet Scholarship program for children of ServNet Auction employees attending both two- and four-year colleges. "We were pleased to expand the scholarship program this year, adding an additional award for $2,500 for a student attending a four-year college," ServNet's Brown said in a news release. "We are very happy to announce the names of seven ServNet scholarship recipients." Recipients of ServNet’s $1,500 scholarship for study at a two-year college include Darlene Delgado and Douglas Stack. Delgado begins her freshman year at Glendale Community College of Arizona, where she will pursue an associate of arts degree in social and behavior science and Stack is going into his sophomore year at Corning Community College in New York, where he is a CAD major. Recipients of the $2,500 scholarship for study at a four-year college or university include Madelyn Andrews, who attends SUNY College at New Paltz, N.Y.; Anne Dabroski of Messiah College in Mechanicsburg, Pa.; Timothy Fujii, a junior at American University in Washington D.C.; Grant Richardson, a junior at Yale University in New Haven, Conn.; and Nina Emmick, a junior at the University of South Dakota, who has been awarded a second ServNet scholarship. Last year, Emmick, daughter of Angela Emmick of KCI Kansas City, won one of ServNet's first scholarships as a sophomore, and she is currently pursuing a degree in nursing. "Encouraging education is vital to the health of our industry, and we're pleased that ServNet's Scholarship program will offer assistance for both two- and four-year college programs," Stanley added. "The auction industry is as much about 'family' as it is about anything else, and we believe that ServNet's Scholarship Program is both an important way to support that family as well as an investment in our future." ServNet said the scholarship program was established last year as an ongoing initiative to help employees and their families pursue higher education. In January, additional information and application forms for the 2018-2019 academic year scholarship awards will be available at www.servnetauctions.com. Janet Barnard, the president of Cox Automotive Inventory Solutions, will deliver Wednesday’s opening general session at the NIADA Convention & Expo. Her address on “Driving Wholesale Velocity Together” is set for 8:30 a.m. (PT) and will delve into “how evolving digital and mobile solutions can address rising off-lease vehicle volumes, changing customer expectations and set independent dealer businesses on a path to profitability,” according to the convention’s website. The conference, which is being held in Las Vegas, began Monday and runs through Thursday. Will Chandler of NextGear Capital, who was slated for a 4:15 p.m. Tuesday breakout session on “Floorplanning Tips for the Independent Dealer” along with Ian Anderson of Westlake and Johnny Shroyer of AFC. For a complete agenda, visit www.niadaconvention.com. 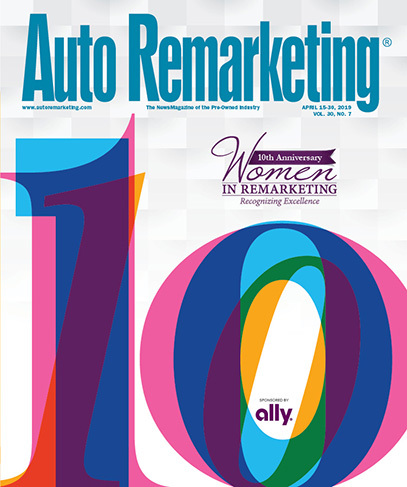 And be sure to catch members of the Used Car Week and Auto Remarketing team this week at booth #1825. KAR Auction Services announced that four of its leaders from KAR and its ADESA and Automotive Finance Corp. business units will be featured speakers and panelists at the National Independent Auto Dealers Association Convention & Expo this week in Las Vegas. The vehicle remarketing and technology solutions provider’s speakers include KAR chief economist Tom Kontos, AFC chief operating officer Joe Keadle, ADESA director of dealer consulting services Doug Hadden and AFC vice president of operations Johnny Shroyer. KAR said Kontos and Keadle plan to discuss the current and anticipated economic strengths, weaknesses, opportunities and threats related to independent dealers on Thursday from 8:30 a.m. to 9:30 a.m. (PDT). On Tuesday, Hadden will deliver a presentation on higher net profits that examines different ways to navigate through lower margins while achieving higher net profits and Shroyer will join other industry experts on the Floorplanning Tips for the Independent Dealer panel. Both of those are on Tuesday from 4:15 p.m.to 5:00 p.m. (PDT). For more information about the convention and this year’s speakers, visit www.niada.com. For more information or to request a free personal demo, call (877) 860-2005 or visit netdriven.lpages.co/niada. For the third year in a row, Donlen has been recognized by the National Association for Business Resources (NABR) as one of Chicago's Best and Brightest Companies to Work For, the company recently announced. Dolen and other winners will be honored at a symposium and awards celebration on July 17 at the Chicago Marriott Southwest at Burr Ridge. "Employee satisfaction and development drives our award-winning culture here at Donlen," the company’s human resources business partner Kelly Elliott said in a news release. "We promote an empowering environment that gives our employees the resources and opportunities they need to find success, grow, and contribute to the exceptional fleet experience that Donlen provides our customers. —Best of the Best Small Business, Medium Business and Large Business. For more information about the Best and Brightest Companies to Work For organization, visit www.101bestandbrightest.com. XLerate Group recently announced that it has brought on Tom Francois as the new general manager of the group’s Badger State Auto Auction in Fond du Lac, Wis.
Francois succeeds Tim Netz, who is retiring after 18 years of service at the auction. Francois said his ability to build and maintain strong client relationships has attributed to his success as a leader, according to XLerate. Francois holds a B.A. degree in business administration from the University of Wisconsin – Lacrosse. In other auction news, Greater Erie Auto Auction recently celebrated its 13th anniversary with over 500 cars in the lanes and $10,000 in prizes for dealers during its latest sales event held this month. “I want to thank all of our dealers and our great employees for 13 wonderful years. Without their daily and weekly support, this would not be possible,” GEAA managing partner Todd Briggs said. On May 9, AFC and NextGear ran special floor plan promos which drew dealers from 14 states, either in-lane or via simulcast. Dave Warren of Dave Warren Chrysler Dodge Jeep won the auction’s grand prize, a John Deere riding lawnmower. “Everyone at GEAA strives to do what is right for our customers daily, and our staff has worked diligently to make Greater Erie a great place to be each week for dealers to buy and sell inventory,” Briggs added. Speed Digital announced it will partner with HemmingsPRO Auctions to host a battle more than 50 years in the making: Mustangs versus Camaros. On May 26, the new partners will bring collectors and enthusiasts a Mustangs versus Camaros sale, the first of a series of monthly themed, timed online auctions. This event will help settle the long-standing rivalry between the two sporsts car brands and determine which American classic is truly most popular, Speed Digital said. "We look forward to bringing this unique auction format to millions of Mustang and Camaro fans," Speed Digital president Neil Pitt said in a news release. "It will be exciting to see which fan base has a stronger showing. Will a Mustang or Camaro bring in the highest winning bid? Will more Mustangs find new homes or will it be Camaros? Only time will tell, but it will be fun to watch it all unfold on May 26." Mustangs and Camaros from 1964 to 2017 will be included in the auction and all inventory will be provided by dealers within Speed Digital's Dealer Accelerate network. Interested buyers can currently bid at hemmings.speeddigital.com. The timed online auction will close on the night of May 26. During the live auction, a 2017 Petty's Garage King Premier Edition Mustang powered by a 5.0L V-8 engine producing 825 HP will be auctioned off at 7 p.m. The customized car signed by Richard Petty himself comes in the Petty's Garage signature limited "ghost series" black and silver paint scheme. According to Speed Digital, the proceeds from the sale of the car will go to charity. "The Petty's Garage Mustang won't be the only vehicle drawing interest during the Mustangs vs. Camaros online auction. You would be hard-pressed to find more premier Mustangs and Camaros in another auction," Speed Digital added. "Two of the most sought-after vehicles that will have bidders reaching for their wallets include a 1969 Ford Mustang estimated to go between $236,000 and $355,000 at the auction and a 2015 Chevrolet Camaro COPO." Other sought after cars include the 1968 Shelby GT500, the 1970 Ford Mustang Boss 302 and the 1969 Chevrolet Camaro SS, which are estimated to go for $133,000 to $187,000, $99,000 to $134,000 and $90,000 to $122,000, respectively, according to Speed Digital. For more information about the upcoming auction email Bentley@speeddigital.com or visit hemmings.speeddigital.com. Copart recently announced the launch of its upcoming fourth annual Copart Rebuild Challenge, a contest where U.S. car enthusiasts and automotive rebuilders competitively demonstrate how they’ve restored, customized or rebuilt a vehicle of their choice. "Every year, the contest draws more anticipation. Since last year's contest concluded, aspiring contestants have been asking when the Rebuild Challenge will be returning, and I'm thrilled to finally be able to say it's back and open for entries," Copart vice president of marketing Michelle Hoffman said in a news release. Up to July 11, contestants can enter the challenge by submitting before-and-after photos of their chosen project to Copart.com/Rebuild. Each entry should include a caption with a brief description of the rebuild project, the online vehicle auction company said. Contestants have the option to share their submissions on social media by using the hashtag "#CopartContest." Additionally, Copart said contestants must also register for free membership to enter the contest. Membership can be obtained through the online registration form available at Copart.com/Register. Following the entry period ending mid-July, a panel of Copart's in-house judges will choose 10 finalists. On July 18 public voting will begin to determine three winners who will be awarded a cash prize, according to Copart. Third place will receive $1,000, second place will receive $2,000, and the grand prize winner will be awarded $5,000. "Any enthusiast or rebuilder can find what they need in Copart's inventory of more than 125,000 vehicles," Hoffman said. "Thousands of muscle cars, classics, exotics and more are available to Copart members every day." For more details about the Copart Rebuild Challenge contest visit, Copart.com/Rebuild. AutoMobility LA has announced that it is now accepting submissions for its 2017 Top Ten Automotive Startups Competition, which recognizes startup companies that have impressive innovations with the potential to shape the future of the new transportation industry. The competition’s finalists will be named just before the 2017 AutoMobility LA show, which will take place this fall at the Los Angeles Convention Center. At the convention, the competition’s winning startup will receive an on-stage advisor session with influencers in the technology and automotive industries. The session’s participating advisors will include Bill Tai, a Silicon Valley venture capitalist, Norman Firchau, the president and chief executive officer of Porsche Consulting North America and Jeff Henshaw, Microsoft’s quantum computing program manager, according to AutoMobility LA. This year, companies will be evaluated by a team of juries made up of the LA Auto Show executive team and senior executives from companies such as Elektrobit, NVIDIA, TIME's The Drive, Porsche Consulting and Microsoft. Additionally, at the upcoming AutoMobility LA show, the competition's finalists will receive access to a complimentary booth space at the convention as well as an invitation to a VIP reception with the AutoMobility LA executive team, advisory board members, top investors and industry executives. “The startups will also be recognized in front of 25,000 media professionals, influential thought-leaders, automakers, tech titans, designers, developers, investors, dealers, government officials, analysts, fellow startups and more,” AutoMobility LA said. Submissions for the Top Ten Automotive Startups Competition will be accepted through July 15. For more information and to apply, visit https://automobilityla.com. Previous competition winners include Argus Cyber Security, Elio Motors, EverCharge, Inc., High Mobility, HopSkipDrive and PolySync. Sheehy Auto Stores has launched its 20th annual Sheehy 8000 sales event, a three-week community-wide effort to raise funds for the American Heart Association, the group announced on Friday. Throughout the rest of the month, each of Sheehy Auto's dealerships throughout Washington, D.C.; Richmond, Va.; and Baltimore will host a variety of initiatives in support of the fundraiser before it wraps up on July 5. "This year is a milestone for us as we continue our mission to raise awareness and funds for a cause that is close to many of our hearts," Sheehy Auto president Vince Sheehy said in a news release. "We are thankful for our customers, communities and team members who rally behind this effort, making each year's campaign more successful than the last." Sheehy Auto said this year’s campaign includes healthy cooking demonstrations, blood pressure screenings and CPR training for employees and the community across all of its locations. "The support of Sheehy Auto Stores has allowed us to make a considerable impact on the health of our communities in the region," American Heart Association vice president of marketing Michelle Nostheide said. "We appreciate the generosity of their team members, customers and vendors, and their efforts towards workplace wellness. Together, we can lessen the burden and loss heart disease and stroke cause for so many families." Last year's Sheehy 7000 campaign raised $225,000 for the American Heart Association, according to Sheehy. Additionally, the dealer group said it has been a several year sponsor of the charity’s National Walking Day, which was held last month at Springfield Town Center in Virginia. Each of Sheehy's dealerships also hosted individual step challenges among employees on the day of the walk. Sheehy Auto said it has raised a total of more than $40 million for community and non-profit organizations since it was founded in 1966.